Terms and Conditions - Livemedia - Livestreaming and archiving, broadcasting on demand, conferences, congresses, events, courses, webinars, reportage and news. Livemedia web channel. Thank you for using our products and services (“Services”). Services are provided by INVENTICS S.A. and the individual activities MEDEVENTS and LIVEMEDIA. By using our Services, you agree with the following terms. Please read them carefully. Our Services have various differentiations, therefore sometimes there might be additional terms or product requirements. events) and Livemedia (internet channel and system of events). 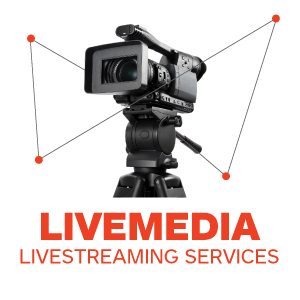 Services for live streaming and storing of congresses, events, training seminars (courses and web seminars), reportage and news. Production of documentaries, broadcasts and reportage. Users can maintain their own channels hosted by Livemedia and submitted to these terms. Users are solely responsible for everything posted on their channel. The Company is committed to undertake with diligence the Livemedia Event Services and Conference System Service without any liability in the case where any disruption occurs which is based on facts out of the Company’s control, because of force majeure like network crash or lag, power crash, or false typing by the Client or lags, errors or technical insufficiency or malfunction of communication network or technical gear of the Client or a third party f.e. a third service network provider which makes it impossible to access the Service temporarily or permanently or any other cause for which the Company has shown no negligence. The Company undertakes every possible effort for the permanent function of services. The User has subscription service by the system with functions which are updated after permanent development. Nevertheless there is no service by order available for any user and the updates are made accordingly to the Livemedia timetable. In case the user wants to end the provided services, the Company provides him with the data he needs to use any other provider. The Company’s system is a subscription service and therefore only the data can be given to the user. The User is obliged to use and conform to any policy of our Service Provisions. Don’t make bad use of our Services. Don’t use the Services in a way which strays you away from conformity according to laws about visitation and safety. The Company takes no liability for any use or bad use of stored material outside of network sites (f.e. sites of third parties, blogs, social media). to use the personal data of clients and subscribed users for providing them with information about congresses and events, reportages, service offers, products and news of the Company. The Company uses up to date technical and organizational measures in order to protect in the most effective way user’s rights. The Company follows all the rules of protection of personal data, which are contemplated by the law and international conventions. The Company is not going to give away any personal data without former approval. The Company will in no way disclose, publish, sell or exchange personal data and information about their visitors/users. The Company secures their briefing and consent or non-consent about processing personal data which concern them, where and for which purpose and the right of the users for oblivion. This means the possibility, after the wish of the user, for deleting any personal data by the data controller, for stopping any spreading of data and the possible stopping of processing them by a third party. The Company gives to any subscriber the right to unsubscribe at any time they wish, making a request, otherwise they are assumed of having given their consent. Periodically the Company updates with various systems the data as well as the possibility of the users to receive information. The Company has already updated every system and service according to the General Data Protection Regulation (GDPR) with the purpose and goal to protect all their users’ private lives and data breaches. The Company has enhanced the opportunity of the user for consent in terms of the GDPR using comprehensible and easy access, so that the user can unsubscribe at any point he wishes. Management and protection of personal data of the visitor/user is subjected to this declaration of terms, as well as to Greek Law. The Company reserves the right to correct or modify this declaration of protection at any time as a response to modifications of the data protection laws. Copyright, symbols and rights on this website (containing its design, layout, image and/or aesthetics) remain always a property of the Company, reserving any partial copyright by the creators. The user of the website Livemedia.gr agrees automatically that the use is only for personal, non-commercial use or only for academic and training purposes. He agrees not to store, distribute, transmit, broadcast, commercially exploit or modify in any way any material or content without former written consent by the Company. Any stored material like videos, photographs and other files on Livemedia.gr are provided with written consent of the organizer- operator of the event. The same applies to congresses- workshops where the operator – organizer maintains written consent and consent for publishing of videos and files of the speakers on the internet. The organizer-operator of the event maintains the right to seek in writing the partial or total subtraction of the material at any given moment. Every speaker maintains the right to seek in writing partial or total subtraction of his speech at any given moment. The clients (organizer- operator) of Inventics S.A. provide in writing the right of hosting the audiovisual material on the website of Livemedia.gr for the agreed use. Owner of stored material is the operator-organizer (client) of the congress or event. In case there are copyright issues in the speaker’s material, the client is obliged to inform in advance and in writing Inventics S.A.
Access rights to stored files of medical congresses have only those who have medical occupation and accept the use. Users of the website Livemedia.gr must be adults, otherwise, they are obliged to have assent and supervision by their guardian. For any further clarification you can contact us here. sketches, texts of the provided services and all the files in general of this website are covered by copyright, registered trademarks and service trademarks of this website and are protected by Greek Law, European Law and international conventions and treaties. Partial or total reproduction of the website in any form is forbidden without former consent of the Company except printing or storing one copy of the content of the website for personal non-commercial use. Visitors/clients/users are informed with these terms about cookies policy used by the Company. The Company may use small text files which are saved on the client’s/ user’s hard disc (cookies) for which the visitor/client/user is informed by the company about their use and advantages. The cookies the Company uses don’t save personal information like name, address, telephone number or e-mail but they can monitor the use of the service in order to provide a more suitable content. They are technically totally necessary for the Service provisions. The visitor/client/user declares, after having studied and comprehended the Service Terms, that he accepts these terms and the cookies policy of the Company without any reservation as applicable as well as the applicable pricelists of the Company. going to be resolved at first amicably. If this is not possible Greek Law must be applied and the cases will be tried exclusively by the Courts of Thessaloniki. The Company bears no responsibility for any false entry or any damage of the user caused by bad use of the information provided by this false entry or application and which are not complying with the goals stated in the statute of the Company and the goals of our individual activities. Personal data voluntarily submitted by the participants to the INVENTICS - MEDEVENTS conferences/events, is collected, stored, processed and used exclusively for the services agreed, within the framework of the legal regulations of the General Data Protection Regulation (GDPR - EU 2016/679). INVENTICS S.A. does not share personal data with third parties. In any case, the participants reserve the right to request their personal data erasure or update via email at info@medevents.gr, info@livemedia.com.